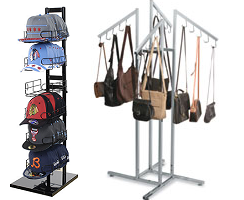 Create a unique and appealing clothing display with your garments and accessories by utilizing our clothing rack displays. 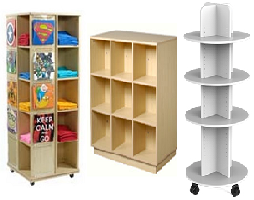 All Store Displays offers Apparel Racks of various types to show off your merchandise to its fullest potential. Select from a wide range of traditional store fixtures, hanger racks, designer cubes and shelving sets. 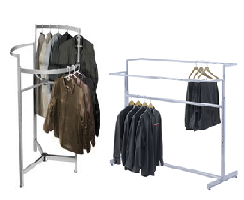 We have all the possible clothing rack displays for you. We are here to help your retail establishment be successful. 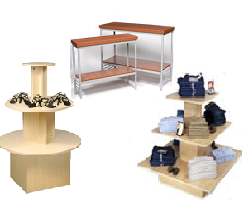 Check out a few of our store fixtures displays listed: Accessory Displays, Display Tables, Hat Racks, Mannequins And Fashion Forms, Merchandisers, Traditional Garment Racks. Change your exhibits to welcome-in the four seasons, the vastly approaching holidays, and score big with the fans advertising jerseys and other team accessories is nothing but smart business thinking. Make sure you have the right equipment on-hand to do so. Customers want to walk into your store and see a refreshing new showcase full of ideas and possibilities. Customer's want easy access to products, great visibility of new merchandise that just came in. Customer's want sales! Advance those patrons that keep walking by and window shopping into daily customers. 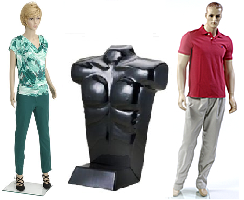 We here at All Store Displays offer you the perfect clothing displayer's to fit your establishment. Come and check us out today!